Emperor Kinmei (欽明天皇, Kinmei-tennō, 509–571), also written as Kimmei, was the 29th emperor of Japan, according to the traditional order of succession. His reign started in 540 and ended in 571. Historians consider details about the life of Emperor Kinmei to be possibly legendary, but probable. The name Kimmu-tennō was created for him posthumously by later generations. Emperor Kinmei's father was Emperor Keitai and his mother was Emperor Ninken's daughter, Princess Tashiraka (手白香皇女, Tashiraka Ōjo). He was the third son; and his older brother was Emperor Senka. Kinmei had six wives and 25 Imperial children (16 sons and 9 daughters). 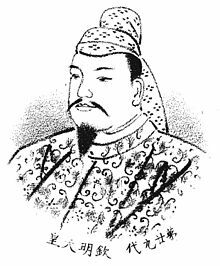 539: Emperor Senka died from old age in 539, and the succession was received by his younger brother, who would become known as Emperor Kinmei. 540: Kinmei accepted his role as monarch (sokui). This was confirmed in ceremonies. 572: In the 32nd year of Kinmei's reign, he died; and his second son became his successor. Kinmei established his court at Shikishima no Kanazashi (磯城嶋金刺宮) in Yamato. Kinmei's reign was marked by the introduction of Buddhism in Japan. The King of Kudara in Korea sent the emperor gifts of Buddhist scripture and a statue of the Buddha. Soga no Iname, also known as Soga no Iname no Sukune. The Soga clan were supporters of Buddhism. Mononobe no Okoshi, also known as Monotobe Okoshi no Muraji. The Mononobe clan opposed the introduction of Buddhism. Nakatomi no Kanamura, also known as Ōtomo Kanamura Maro. The Nakatomi clan opposed the introduction of Buddhism. This emperor's official name after his death (his posthumous name) was regularized many centuries after the lifetime which was ascribed to Kinmei. According to the Imperial Household Agency, the emperor's final resting place is in an earthen tumulus (kofun). Kinmei is venerated at a memorial Shinto shrine (misasagi) which is associated with the burial mound. ↑ 1.0 1.1 Imperial Household Agency (Kunaichō), 欽明天皇 (29); retrieved 2011-10-18. ↑ Titsingh, Isaac. (1834). Annales des empereurs du Japon, pp. 34-36; Brown, Delmer et al. (1979). Gukanshō, pp. 261-262; Varley, H. Paul. (1980). Jinnō Shōtōki. pp. 123-124; Nussbaum, Louis-Frédéric et al. (2002). "Traditional order of Tennō" in Japan encyclopedia, pp. 962-963. ↑ 6.0 6.1 6.2 6.3 6.4 6.5 Brown, p. 262. ↑ Varley, p. 44. Compare Imperial Household Agency (Kunaichō), Ceremony of Accession (Sokui-no-Rei); retrieved 2011-12-23. ↑ Titsingh, p. 36; Brown, pp. 261-262, Varley, p. 44. ↑ 10.0 10.1 10.2 10.3 Martin, Peter. (1997). The Chrysanthemum Throne: a history of the Emperors of Japan, p. 34. ↑ Aston, William. (1998). Nihongi, pp. 146-147. This page was last changed on 29 August 2018, at 15:15.